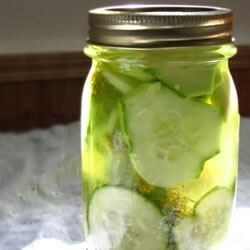 "This recipe was given to me by my late mother-in-law and makes use of the abundant summertime supply of cucumbers. A neighbor recently presented me with four five gallon buckets of cucumbers from his garden and I made pickles for the whole neighborhood. They will also stay fresh in the refrigerator for 2 1/2 to 3 weeks." A quick and easy way to make dill pickles at home. So easy to do, and the taste is excellent. I even kept adding cucumbers for weeks into the recipe and it was just as good!